We had good intentions of going to church on Sunday morning, but the weather thought otherwise. Since we woke up to freezing ice pellets falling from the sky, we decided it would be best to just stay in. Most of the day we lounged around, ate, and watched movies. I even got to sleep in to a shamefully late hour thanks to my husband who played Mr. Mom to our baby. In the evening, I decided to accomplish one thing for the day - organizing my wall of wool and studio/office. For some of you fiber artists out there, my collection of wool roving and other fibers probably seems meager. I estimate over 20 pounds there that I've gathered over the last few years which is quite a lot to me, yet it never seems enough at times. And, I had another 5 pound box that I didn't have enough room on my wall for. Not only did my piles and piles of wool get a makeover, but I also cleaned up my entire studio/office space which was quite a chore. I'm glad that I took the time on Sunday to straighten things up. I always feel much better when my work space is organized with everything in its place. 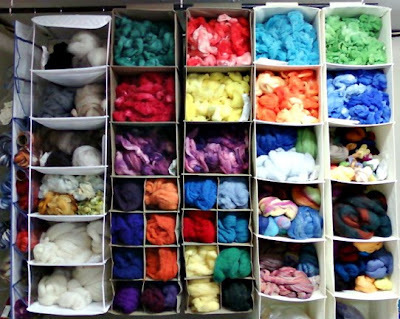 This makes me wonder how others organize there own wool roving, fibers, yarns, etc. If you'd like to share, please post a link in the comments to a photo of your own "wall of wool" or otherwise studio or office space. They are indeed the hanging style closet organizers. I have a rod in my studio/office going across part of the ceiling. I just hang the inexpensive organizers on the metal rods suspended from the ceiling. That way they are always out in the open and accessible at all times so I can see everything that I have to work with. The fabric organizers allow the wool to breath too and are very inexpensive. I got those pictured for $5 - 10 each. Oh Wow! This is awesome. All that fiber. Double Drool. What a great job of organizing. You want to come and organize mine next?